I took this hike by myself. Since I was by myself, I took the most popular route, and was it ever popular. Apparently on the 3rd Saturday in August, there is always a fund raiser for Lung Cancer where a whole bunch of people attempt to hike to the summit of Greys. When I hit the trail head, there were some people logging the number of people attempting the hike, and at 8:20 am there log was already over 100 people. 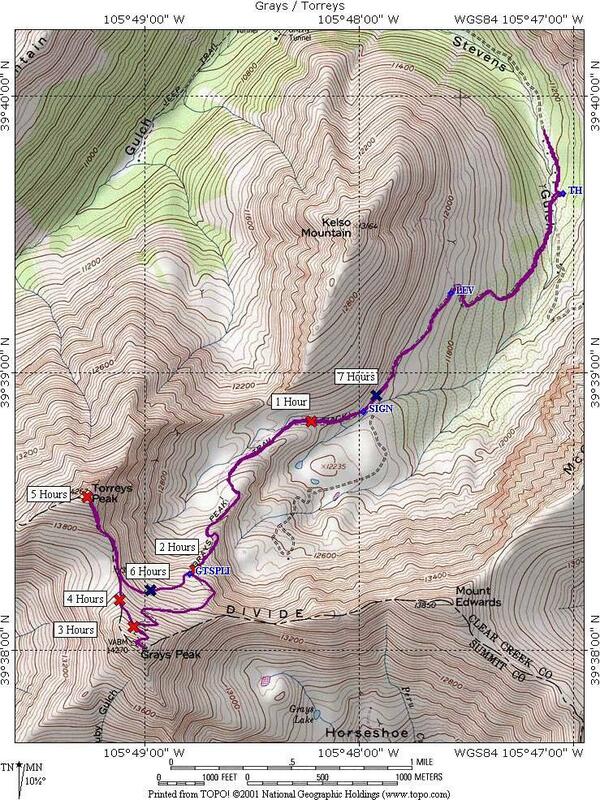 So I would recommend not going on this hike on the 3rd Saturday in August. One nice side effect of all of these hikers is that I was not the slowest on the trail this time. Sorry for the width of this plot. The "x"s are where I was at each time interval from the trail head. The track on the plot is not a drawing by me, but is the actual GPS track. It was fairly quiet. The first item to notice on the plot is how far I had to park from the trail head, approximately 0.3 miles. The times on the map are times from the trail head, not from where I parked. The trail departs from the trail head, and immediately crosses Stevens Gulch. The parking area is close to tree line, and tree line is quickly obtained. The trail continues to climb through willows. However, unlike Bierstadt, the trail is wide and dry through the willows. In fact, the trail is still officially a forest service road. At approximately 0.9 miles, the trail levels out for a spell. At 1.5 miles the forest service road leaves the trail to your left, and you come to a forest service sign indicating distances and times to the summits. The trail starts to climb again, crossing a small skree field. As the climb continues, the landscape gradually turns to skree. At 2.7 miles a junction is reached where the right hand trail leads to the saddle between Greys and Torreys, and the left hand goes directly to the summit of Greys. I took the left hand on the ascent. However, if one was to attempt both peaks, I think that going for Torreys first would be a better choice. The hike from the saddle to the summit of Torreys is steeper than from the saddle to the summit of Greys. I should note, that the trail from this junction to the saddle is narrower and goes through worst skree than the trail to the summit of Greys. The summit of Greys was reached at about 3.6 miles. I spent some time in the zoo that was the summit of Greys. There was no sign in register that day, and with all of the people, I could not find the USGS marker that the map says should be there. I then started back down the trail, leaving the main trail a couple of hundred vertical feet below the summit and making my way over to the saddle and hiked to the summit of Torreys. This is a much steeper climb than the path I used to get to Greys. In fact on this day, a hiker fell over the edge and down 300 feet, with a rock jarred loose from the fall hitting the hiker's head. All Denver TV News had vehicles at the parking area by the time I got back down. The summit of Torreys was reached at about 4.4 miles. Coming back down from the summit of Torreys, I saw Mountain Goats, and got quite close to one that was grazing on the trail. After reaching the low point of the saddle, a short climb is required to catch the trail back to the main trail, thus avoiding going all of the way back to the summit of Greys. The trail junction was at approximately 5.3 miles. Pictures from the hike can be seen here, to keep the loading of this page to a reasonable time.